Congratulations to two brave Americans, who have spoken up publicly for the informed consent ethic, which includes the right of parents to make informed, voluntary vaccination choices for their children. Each undoubtedly knew how much criticism and pressure might come as a consequence, but must have chosen to speak out, nevertheless, as a matter of conscience. They and all those who stand up for truth and freedom, despite the personal or professional risk, are following in the footsteps of those who came to America to escape persecution for their beliefs and fought to create a democracy that protects minorities from exploitation by the powerful. As we are all witnessing, proposed HPV vaccine mandates are rolling through many state legislatures at warp speed. 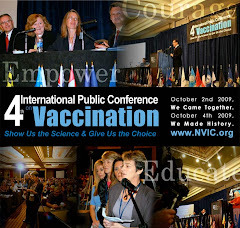 State and federal health officials (who are supposed to be legally prohibited from playing politics) and drug company lobbyists are in state Capitols pressuring politicians to make every little girl in America get injected with three doses of HPV vaccine before becoming sexually active or be denied the right to attend school. They are voting to mandate a vaccine for a disease which cannot be transmitted in school and which will cost the parents, the states and the nation billions to prevent a cancer, which can be almost 100 percent prevented through either abstinence, condom use or annual pap smears. Citizens in every state, who want to be free to make vaccine choices in the future, should pick up the phone, get to a fax machine, send an email or get in the car and go visit their state representatives and senators and make their voices heard. 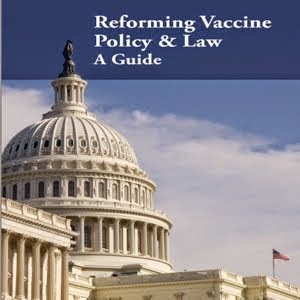 There is only one mechanism in a democracy for getting vaccine laws passed, which support the right to voluntary, informed consent: vote for politicians who will vote for freedom or vote them out in the next election. So I've been watching all these ads on TV telling people to find out about GARDASIL. And then I read that Merck was lobbying for this vaccine to become mandatory. Then I saw that the Texas governor is making this vaccine mandatory in Texas for preteens. So I finally decided to look into it. 2) HPV is a sexually communicable (not an infectious) virus. When you consider all strains of HPV, over 70% of sexually active males and females have been exposed. A condom helps a lot (70% less likely to get it), but has not been shown to stop transmission in all cases (only one study of 82 college girls who self-reported about condom use has been done). For the vast majority of women, exposure to HPV strains (even the four "bad ones" protected for in GARDASIL) results in no known health complications of any kind. 3) Cervical cancer is not a deadly nor prevalent cancer in the US or any other first world nation. Cervical cancer rates have declined sharply over the last 30 years and are still declining. Cervical cancer accounts for less than 1% of of all female cancer cases and deaths in the US. Cervical cancer is typically very treatable and the prognosis for a healthy outcome is good. The typical exceptions to this case are old women, women who are already unhealthy and women who don't get pap smears until after the cancer has existed for many years. 4) Merck's clinical studies for GARDASIL were problematic in several ways. Only 20,541 women were used (half got the "placebo") and their health was followed up for only four years at maximum and typically 1-3 years only. More critically, only 1,121 of these subjects were less than 16. The younger subjects were only followed up for a maximum of 18 months. Furthermore, less than 10% of these subjects received true placebo injections. The others were given injections containing an aluminum salt adjuvant (vaccine enhancer) that is also a component of GARDASIL. This is scientifically preposterous, especially when you consider that similar alum adjuvants are suspected to be responsible for Gulf War disease and other possible vaccination related complications. 5) Both the "placebo" groups and the vaccination groups reported a myriad of short term and medium term health problems over the course of their evaluations. The majority of both groups reported minor health complications near the injection site or near the time of the injection. Among the vaccination group, reports of such complications were slightly higher. The small sample that was given a real placebo reported far fewer complications -- as in less than half. Furthermore, most if not all longer term complications were written off as not being potentially vaccine caused for all subjects. 6) Because the pool of subjects were so small and the rates of cervical cancer are so low, NOT A SINGLE CONTROL SUBJECT ACTUALLY CONTRACTED CERVICAL CANCER IN ANY WAY, SHAPE OR FORM -- MUCH LESS DIED OF IT. Instead, this vaccine's supposed efficacy is based on the fact that the vaccinated group ended up with far fewer cases (5 vs. about 200) of genital warts and "precancerous lesions" (dysplasias) than the alum injected "control" subjects. 8) GARDASIL is the most expensive vaccine ever marketed. It requires three vaccinations at $120 a pop for a total price tag of $360. It is expected to be Merck's biggest cash cow of this and the next decade. These are simply the facts of the situation as presented by Merck and the FDA. This vaccine was just approved in June, 2006. It was never tested on pre-teens except in a tiny trial run with at most 18 months of follow up. Even if we subscribe to the theory that HPV causes cervical cancer, there is ZERO hard data showing that this vaccine reduces cervical cancer rates or cervical cancer mortality rates, which are both already very low in the US and getting lower every year. Now Texas has already made this vaccine mandatory for middle school with all sorts of useful idiots and Big Pharma operatives clamoring for more states to make this vaccine COMPULSORY immediately. Has everyone gotten the picture or should I continue? Keep fighting the good fight! Thank you for your work on behalf of American children and parents. There's a good reason that 2/3 of Texans voted against Rick Perry; he's owned by special interests. I was furious about the Hep B (another Merck vaccine) being made mandatory; when first introduced my pediatrician was recommending AGAINST it for children who weren't in daycare or otherwise in a category that might be considered at reasonable risk of contracting the disease. When it became mandatory, I filed for the exemption. I'm rather ticked that the religious right (and I'm a religious individual myself) allowed themselves to be baited by Merck into making this primarily a sexual morality debate. It has distracted from the medical and ethical reasons, which I find more compelling. because they want to make it mandatory for girls before they enter 6th grade.